President Michel Suleiman said that Lebanon was fully committed to the implementation of U.N. Security Council Resolution 1701 and added that the international community should urge Israel to stop its threats against Lebanon. "Lebanon reiterates its full commitment to Resolution 1701," Suleiman said in a speech Tuesday before the 63rd U.N. General Assembly session in New York. "Lebanon is facing a series of dangers and challenges which require the international community to compel Israel to implement Resolution 1701…and stop its dangerous threats to launch a new war on Lebanon," the president said. He said the international community should help Lebanon recover its occupied land and ask Israel to stop its violations of Lebanese airspace and provide detailed maps of mines and cluster bombs it dropped on Lebanon. Suleiman vowed that the Lebanese government will obligate Israel to pay compensations for all the damages that resulted from its "repeated offensives on Lebanon." He told world leaders in his speech at around 11:40 pm Beirut time that another challenge for Lebanon was "to confront terror in all its forms and maintain civil peace." Coming up with a national strategy "to protect Lebanon and defend it," is another challenge, according to Suleiman. Suleiman reminded world leaders of Lebanon's bid for a two-year non-permanent Security Council seat. Lebanon "had presented its candidacy to a non-permanent Security Council seat earmarked for Asia during 2010-2011," he said. 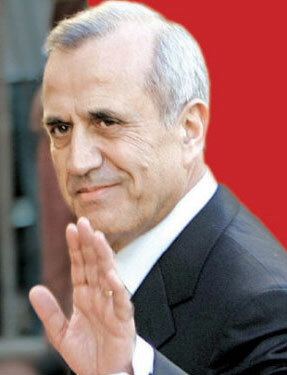 We hope that we get the backing of all "friendly countries" for this candidacy, Suleiman added. He said Lebanon is committed to the international tribunal that will try ex-Premier Rafik Hariri's suspected assassins and is ready to cooperate with the U.N. to seek the truth behind the Feb. 2005 bombing and related crimes. Suleiman expressed Lebanon's rejection to naturalize Palestinians and stressed their right of return to their homeland. The Lebanese president also brought up during his speech the issue of Lebanese-Syrian relations. He said he visited Damascus on August 13 and agreed with Syrian President Bashar Assad to establish diplomatic ties between the two countries, demarcate the border and find a solution to the issue of Lebanese missing during the civil war. Beirut newspapers said Wednesday that Suleiman had met on the sidelines of the General Assembly session with Syrian Foreign Minister Walid Muallem, who informed him that a joint statement will be issued after the Fitr holiday on the establishment of diplomatic ties between the two countries. The third day of President Michel Suleiman's visit to New York started in the morning at the U.N. General Assembly hall and ended at night in a meeting to assess and prepare for the last day which is distinguished in appointments with heads of state. - Around 10:00 am Suleiman, accompanied by Foreign Minister Fawzi Salloukh headed for the U.N. General Assembly session. - The first with U.S. President George Bush, which was the second quick meeting between the two leaders in 24 hours after the small talk on the sidelines of the welcoming ceremony hosted by Bush on Monday. The two presidents pledged to plunge into details during their meeting at the White House on Thursday. - The second with French President Nicolas Sarkozy where the two leaders agreed to hold in-depth talks on the sidelines of a Francophone meeting scheduled in Canada next month. - The third with Syrian Foreign Minister Walid Muallem and his aide Faisal al-Miqdad. Following the handshakes, Suleiman moved on to meet with the Qatari delegation which is staying at the building facing the U.N. headquarters where the Lebanese president held talks with the Emir of Qatar Sheikh Hamad Bin Khalifa al-Thani before returning to the Waldorf Astoria Hotel where he dedicated himself to putting the final touches on the speech he delivered before the U.N. General Assembly at midday. About 1:30 pm, Suleiman and his wife had lunch at the Waldorf Astoria hotel when head of the Presidential Guards Brig. Gen. Wadih Ghafri as well as a number of officers and aides dined at the same restaurant. At 2:15 pm, Suleiman headed a preparatory meeting of the president's advisors in the presence of Nawaf Salam, the permanent representative of Lebanon to the United Nations, before moving to the U.N. headquarters. At 5:00 pm, Suleiman returned to the hotel where he met a small group of journalists and thanked them for covering his U.S. trip. Suleiman, afterwards, met with Lebanon's ambassadors to New York and Washington, Nawaf Salam and Antoine Shedid, in addition to the president's advisor ambassador Naji Abi Assi to assess progress of the visit. Syria had informed President Michel Suleiman about its decision to boost its military presence along the northern border with Lebanon four days before the move, according to information revealed to Naharnet. The Syrian deployment is part of a program that includes military maneuvers and that the leadership in Damascus had taken the decision and had begun implementing on Syrian territories, a source from the Lebanese delegation accompanying Suleiman to New York said. He expected things to return to normal in one week or ten days. Meanwhile, Syrian Foreign Minister Walid Muallem, who is representing his country at the U.N. General Assembly session, told a member of the Lebanese delegation in one of the Assembly hallways that Syria's expectations about misinterpreting the maneuvers materialized. Muallem said that the maneuvers were "given interpretations that had nothing to do with reality." "We informed you officially about them (troop build-up) days before" the move. "But still they accuse us of putting pressure on you while the president (Suleiman) is in the United States," Muallem told the Lebanese delegation member. U.S. Secretary of State Condoleezza Rice has made every effort to try to convince President Michel Suleiman to extend his stay in Washington and expand his agenda beyond the White House and the foreign and defense departments toward Congress and Republican presidential hopeful John McCain. High-ranking sources at the State Department said Rice and her aides held a preparatory meeting with Suleiman on Monday afternoon at his hotel headquarters ahead of official talks scheduled to take place in Washington on Thursday. Rice also aimed at finding out what Suleiman thought about U.S.' desire to expand the Lebanese timetable. Rice, however, sensed an unchanged Lebanese stance – Suleiman's previous commitments that prevent him from extending his stay in Washington. While the official Lebanese delegation accompanying Suleiman adopted a hush-hush policy, a senior official told Naharnet that the President "will not waste a minute in doing everything he can to help Lebanon achieve its goals and interests." "He (the President) is in the U.S. for that purpose," the official stressed. "The steps taken by Lebanon should be carefully examined at this delicate stage," he said, adding that Lebanon has to take both internal and external considerations into account, just like the U.S. does. The official said the U.S. is not likely to undertake serious measures to support Lebanon. This was made clear in remarks made by Rice and U.S. President George Bush to Suleiman during the welcoming ceremony. "President Michel Suleiman is aware that he won't bring back with him from the United Nations and Washington tangible results that would reflect on the situation in Lebanon but still he decided to go to the United States." With these words a member of the Lebanese official delegation in New York summed up to Naharnet the reasons behind Suleiman's visit to the U.S. during a chat at the Waldorf Astoria hotel. "The president, who is working since taking office to return the role of the president,…had to go to New York and Washington after...taking several steps in inviting for the dialogue table and sponsoring it on Sept. 16," the source said. "The Lebanese presidency has been practically missing from the U.N. since four years, particularly after the adoption of (Security Council) Resolution 1559 which considered in one way or another the extension of ex-President Emile Lahoud's mandate illegitimate. This led to a rupture in relations between the international community and the president which reflected negatively on the presidency and its role," the official source added. He said several Lebanese officials have visited the U.N. headquarters in New York and the White House except for the president who remained "isolated." Lahoud's last visit to the U.N. "consolidated the presidency's isolation" as the former president didn't meet with heads of state of major powers, the official said. "That's why President Michel Suleiman decided to bring Lebanon back to the international stage" and take part in several events, including the 63rd U.N. General Assembly session and the Francophone summit that will be held in Canada in October, he said. Meanwhile, Suleiman began his work schedule in New York with talks with Egyptian Foreign Minister Ahmed Abulgheit and Arab League chief Amr Moussa before heading to a meeting of world leaders to assess Africa's development. Representatives of more than 160 countries, among them French President Nicolas Sarkozy and Tanzanian President Jakaya Kikwete, and U.N. chief Ban Ki-moon attended the high-level gathering, a day before the General Assembly's annual general debate. Suleiman also held talks with U.S. Secretary of State Condoleezza Rice to prepare for his meeting with U.S. President George Bush and other officials in Washington on Thursday. The Lebanese president further met with Paraguay's president Fernando Lugo and Cypriot leader Dimitris Christofias who invited Suleiman to visit their countries. President Michel Suleiman and his accompanying delegation arrived in New York at 3:15pm Sunday (10:15pm Beirut time) to attend the 63rd U.N. General Assembly session. Lebanon's permanent representative to the U.N. Nawaf Salam welcomed Suleiman at John F. Kennedy international airport. Also present were members of the Lebanese mission there, the Lebanese ambassador in Washington Antoine Shedid and head of the Middle East Airlines in the U.S. Adib Kassis. The president is accompanied by his wife Wafa, his political adviser and former MP Nazem al-Khoury, Foreign Minister Fawzi Salloukh, ambassador and adviser Naji Abi Assi, head of the presidential guards brigade Brig. Gen. Wadih Ghafari, presidential office chief Col. Wajih Rafeh and media official Adib Abi Akl. Suleiman and his aides headed from the airport to the Waldorf Astoria hotel and put the final touch on his program and meetings planned with several heads of state and foreign ministers on the sidelines of the U.N. General Assembly session. Lebanese delegation sources said that although Suleiman's agenda is not yet complete, the president plans to meet with Chinese Premier Wen Jiabao, Qatari Emir Sheikh Hamad bin Khalifa al Thani, Turkish President Abdullah Gul, Brazil's head of state Luiz Inacio Lula da Silva and Iranian President Mahmoud Ahmadinejad. Suleiman and the first lady will attend on Monday night a welcoming ceremony hosted by U.S. President George Bush at the Waldorf Astoria. They will also meet U.N. chief Ban Ki-moon ahead of the traditional dinner hosted by the world body's secretary-general for all delegations. The Lebanese delegation is occupying 20 rooms in the hotel, including the presidential suite where Suleiman is staying. The hotel's administration said that this year's delegation was one of the smallest that stayed at the hotel over the past years. President Michel Suleiman, accompanied by an official delegation, left Beirut's Rafik Hariri International Airport around 11 am Sunday heading for the United States on a double purpose trip: The first to New York to address the U.N. General Assembly and the second to Washington to meet President George Bush, U.S. Secretary of State Condoleezza Rice and Defense Secretary Robert Gates. An Airbus A 330-200, placed by the Middle East Airlines under Suleiman's disposal, has carried the President and the accompanying delegation. MEA had planned to place a new Airbus jet it had recently received from Airbus' main factory in Toulouse, southwest France, at Suleiman's disposal since it bears the Lebanese flag. But Suleiman insisted on using an old jet of the same type due to MEA's need of it. In addition to Captain Hisham Dabbous, the crew comprised of a reserve captain and two co-pilots (instead of one captain and one co-pilot) as well as 12, instead of 9, hostesses and stewards in view of the fact that the trip is a 12-hour flight which requires shift rotation in line with safety standards set by the International Civil Aviation. MEA sources told Naharnet that the aircraft will stay at John Kennedy Airport in New York until Wednesday evening when it is scheduled to carry Suleiman to Washington. It will take the President and the accompanying delegation back to Beirut Thursday evening. According to information obtained by Naharnet, MEA planned to keep the presidential jet on U.S. ground due to the short stay and because of the high cost in the event that the aircraft was returned to Beirut. MEA sources confirmed that Lebanon's national carrier will not be affected by keeping one of its planes out of service for five or six days. It is worth mentioning that the aircraft put at the President's disposal can carry up to 250 passengers – 42 Business Class seats and another 208 Economy Class. This year's delegation has also shrunk in line with Suleiman's decision to squeeze expenses and spare the treasury expenditures of a wider delegation plus their hotel stay. The Lebanese media has also paid the price for the President's measure in which the accompanying press delegation had been limited to a small number. Despite the journalists' understanding and appreciation for the President's decision, they suggested that a number of them accompany Suleiman on the jet, provided that their institutions cover their stay in the U.S. and undertake the necessary steps to provide visas and permits that allow them to enter the U.N. headquarters in New York. After having to wait for a long time, the President rejected the proposal, prompting journalists to seek visas, permits and reservations on their own. While the presidential aircraft flew semi-empty, journalists left in batches according to seat availability as of last Friday and via Paris or London, costing media outlets huge money that could have been spared without having to load the Lebanese treasury. Most journalists arrived shortly before or at the same time as the President's plane landed in New York. They have been distributed on a number of hotels near Waldorf Astoria where the official delegation is staying.